The local art industry and many in the Philippines mourns over the untimely demise of popular personality Arvin Jimenez, aka Tado as well as other local artists Andrew David Sicam, Gerard D. Baja, and Giovanni “Bam” Morillo. They were amongst the casualties of yesterday morning, February 7, 2014’s tragic bus accident at Bontoc, Mountain Province. According to reports, the Florida bus line (now suspended) transporting 47 people plunged into a ravine while traversing Sitio Ab-ab in Barangay Bayyo. According to LTFRB, the bus may have lost its breaks while at a descending road. Van-Deven is a Dutch national while Laring is Canadian. Most passengers were tourists heading for a mountaineering trip while some were members of Christian churches who were supposed to attend an event. 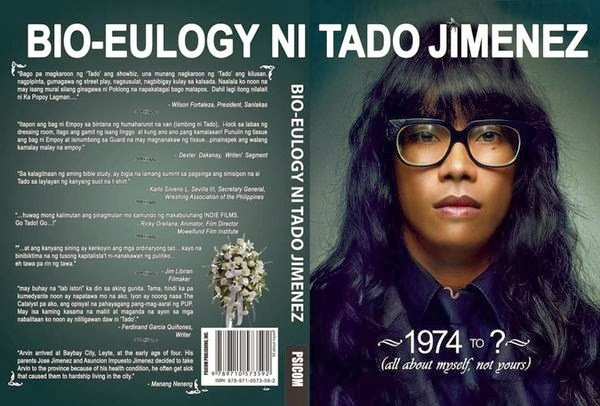 Social media is filled with condolences and well wishers for comedian Tado’s journey to the next life. Not everyone will be open to this idea but I am. Tado is best known for comedic roles and overall funny personality along with his stick figure, large spectacles, and long hair. He is popularized through several TV shows such as Strangebrew in UNTV, radio jock in The BrewRATS at U92, and appearances in movies. He also owns an apparel (graphics t-shirts) and toy collectible shop, LimiTado. He was involved in arts at various fields including theater, painting, photography, music, filmmaking, and book writing. He formed the group Dakila along with other local artists to help instill heroism in modern day living. He wrote the books Nag-iisa Lang Ako and It’s All About Myself, Not Yours. The latter was dubbed as a bio-eulogy. Strange enough, there were several supposed premonitions through his social media posts prior to his death. He was also working 40 Mountains, a series of videos chronicling his mountaineering adventures. Aside from Tado, other artists we mourn are Andrew Sicam from the band Kinaiya, visual artist Gerald D. Baja, and Solar TV News head of the graphics department Giovanni Morillo. In fact, Tado was with 16 companions on the trip and most of them are artists. Fare thee well Tado, other local artists with you, and the rest of the victims. Comfort be with your bereaved families.